Resistance to networked lighting controls is melting away as technology and understanding of benefits improve. To make these savings a reality, however, requires overcoming a number of current obstacles to widespread adoption of networked lighting controls. These difficulties include the expensive, complicated nature of network systems; inadequate training for installers; poorly understood benefits that limit demand; proprietary software that doesn’t always integrate well with other building systems; lack of protocols for cybersecurity; and limited or poorly-designed utility support. Fortunately, the lighting industry understands these challenges and efforts are underway to address them on several fronts. Some challenges will be tackled through technology — moving from many proprietary systems to more standards-based ones with commonalities around how networked lighting controls are installed, connected, and communicate. This is already happening, with newer systems coming to market in the last year or two being simpler to install, requiring less training for installers, and providing an easier experience for end-users. Building owners and facility managers in the market for networked lighting controls should look for these standards-based systems. In addition, as with all major purchases, it’s important to buy from companies with good track records of reliability, performance, and support. The DesignLights Consortium’s Networked Lighting Control Qualified Products List provides information about which systems are standards-based, which come pre-installed within light fixtures, and the comparative complexity of installing them. Finally, it’s essential for those considering installation of LEDs and networked lighting controls to contact their local utility companies and take advantage of any rebates offered. Currently, more than 6,500 utility rebates from 240 utility programs are available on DLC-qualified products in the United States, with the average per product rebate nearing $80. By using rebates, building owners and facility managers can typically reduce the upfront cost of a project by 20 to 25 percent. The advent of LEDs, combined with other factors such as changes in utility efficiency programs, have set off a movement toward greater efficiency in commercial and industrial lighting that is now well underway and delivering results. Building owners and facility managers have the ability to significantly reduce their electricity consumption through improved LED technology, which also promises to increase tenant and employee comfort and productivity. Looking at the global picture, super-efficient LEDs represent the fastest route to reducing electricity consumed by buildings and the carbon emissions associated with generating that power. As the market penetration of LEDs in the United States grows over the next several years, the technology can reduce peak demand that’s now often met by firing up the country’s most polluting power plants. 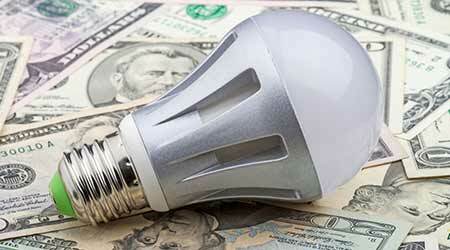 As noted earlier, adding networked lighting controls to LED installations boosts energy savings by an average of 47 percent beyond savings from LEDs alone. Annually, these savings are approximately equal to the annual output of Arizona’s three-reactor Palo Verde Generating Station, the largest power plant in the United States by net generation— and those savings are projected to persist for a decade or more. Christina Halfpenny is executive director of the DesignLights Consortium, a non-profit organization dedicated to accelerating the widespread adoption of high-performing commercial lighting solutions. The study, “Energy Savings Potential of DLC Commercial Lighting and Networked Lighting Controls,” was conducted by Energy Futures Group’s Dan Mellinger on behalf of the DesignLights Consortium.